This App offers your customers the possibility to subscribe to your Mailchimp newsletter, either on your store or during the checkout process. Your customers can complete the form for newsletter subscription or they can check in a box on the checkout page meaning that they will be automatically subscribed to your Mailchimp list and they agree to receive information from your store. This App is a great way to address your customers in email campaigns, telling them about your new products, discounts, store news and more. In order to select a Mailchimp list where you visitors can subscribe, first you need to connect your Soldigo store to Mailchimp and second, create one or more lists in Mailchimp. 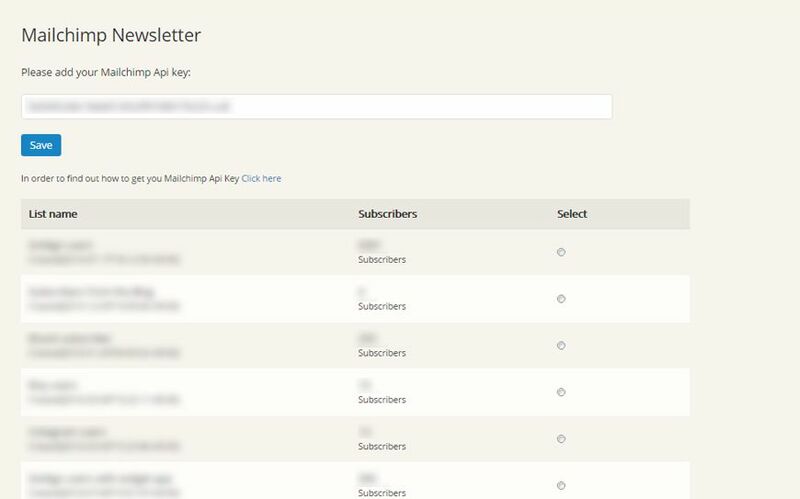 After you connect your Soldigo store with Mailchimp you will need to select a newsletter list where your customer can subscribe. Simply select the desired list and click Save. If you don’t save any list you will need to create at least one on Mailchimp.